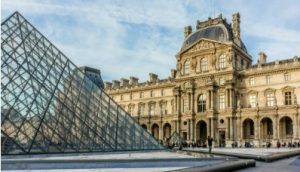 Event Description: An intriguing site for a corporate team building event, the Louvre is perhaps the world’s preeminent art museum treasure. Dan Brown set the precedent, in fiction, for mysterious misadventures in the City of Lights; now here’s your chance to actually play a treasure hunt at the Louvre, in dazzling reality. What more, really, can be said about the Louvre—the world’s greatest art museum, home of the Mona Lisa, the Venus de Milo, the Nike of Samothrace. During your corporate team building treasure hunt…you’ll explore this vast and fascinating museum from top to bottom, navigating back staircases, searching through galleries both famous and neglected, from Greek Sculpture to NeoRealism to Islamic Art. Expect a dazzling journey for the eyes and a stimulating adventure for the mind as you see the Louvre like you’ve never seen it before! Admission not included in program fee. Gather near the glass pyramid.